Addicted to saying “yes”. It’s a thing! Mariane Louvet, Daughter, mom, friend. Women in IT, Networker. Runner, kickboxing & yoga enthusiast (keeps me sane and those around me safe.) Coffee & fashion lover. “Can you drive me here?” Yes. Do any of the above mentioned sound familiar to you?? How often do you automatically say yes? I bet if you go through a typical week in your life, you probably say yes to more than you thought, and to things you really don’t want to. It’s an instinctual response for certain people. I, being one of those people. The moment someone asks me to do something, to help with something, to go for dinner, etc.. pretty much anything, and my response is yes. I am almost pre-conditioned to respond in that matter. Even though my brain and my gut are telling me say no, I open my mouth and “Yes” is already out there! It is an addiction of sorts. Yes, really. When you think of saying no, our immediate thought is of the reaction from the person asking. This is what we are most afraid of. We have become conditioned to say yes, to be people pleasers. We do not want someone to be mad at us for not coming to their dinner party, not being able to take on extra work, bake cookies, drop them off at a friend’s, or for many other requests. The problem with this “perfectionist” world that we have created, is that it is actually making us sick. There are only 24 hours in a day. How many of them are spent doing something for someone else? Something that you really did not want to do? Don’t get me wrong, there are things we have to do, whether we like them or not. That does not mean we need to say yes to everything, all the time. The past few months I have been feeling run down and, well, honestly overwhelmed. Did not admit to it, and thought it would pass. Sat down with my GP and smiled as I told her what I was taking on, what I was doing in my life, and that I was feeling a little tired. She stared at me and grabbed her prescription pad and quickly wrote something down. As she was writing she told me that this prescription was what I needed to make me feel better, and with that she handed me the paper. I looked at her and shook my head, what was this??? My GP has known me since I was 16. More than half my life. She has seen me go through good and bad times, she has always steered me in the right direction. So, why was she giving me this prescription? She went on to explain to me that I am exhausted because I am afraid to say no, and therefore completely over extending myself. It seems that I don’t want to upset anyone, so I simply say yes to everyone. Well, everyone, except me. 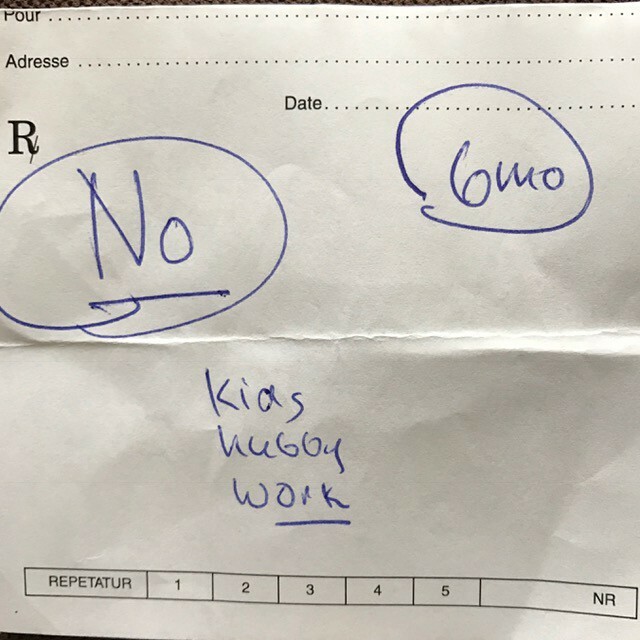 With this prescription, which by the way is valid for 6 months, I am to learn to say no. Right away; no. Without thinking; no. This will give me the option to actual think about what is being asked of me, before answering. If I feel I want to actually say yes, then I can. But, I have to think about it. Take a step back. No more instinctively blurting out an instant “Yes”. Should it be required, I am to show the asker, the actual prescription. At first I laughed. Actually, I was in tears from laughing. The thought of me saying no to anyone, well, that wasn’t going to happen. But, she told me, that it was going to happen, and it that it starts now. I left her office, still laughing. But then, I thought about what this really meant. The ability to say no was foreign to me. How would people react? I have always said yes. Would I lose credibility? Would people I care about be upset with me? Ugh. Already I was stressing. I thought after all these years that my Doctor would know me better, this was not good for me. Why on earth was she putting me in this position? -No, I cannot do another load of laundry today. -No, I am not adding another meeting to the schedule that day. -No, I am not going to make it out to that dinner party. Wow. It seems that I was capable of saying no. Where was this voice coming from? Who was this person? And most of all, an unexpected out come from saying no….I had some extra time. Free time, I think is what they call it. I actually read my book for book club, weeks in advance, not the day before, or on my way to book club. Caught up on my PVR’d “The real Housewives of Beverly Hills” (Don’t judge!). My workout schedule was growing; a run and yoga in the same day? Who knew? I looked at that piece of paper that my GP gave me, my prescription to say No. That paper was a game changer. That said, why did it take a prescription to teach me how to say no? Why can’t we figure this out before we feel like we are about to burn out, before that horrible feeling of being overwhelemed and not sure what direction to take. Why? We are already accountable for so much, but we tend to forget that we don’t have to say yes to everything all the time. It has been almost 2 months for me, and I carry that paper with me everywhere I go. To date, I have not lost any friends, my kids still talk to me, my friends still love me, and I even changed roles at work. It’s a work in progress, but I am actually starting to feel a lot better. Maybe we should all have a prespcription to say no. Writing is an outlet for me. It has always been easier to pen thoughts than to speak them. Sometimes I share them, sometimes they are just for me. PR and Communications Degree at UVIC , class of 2019. PI in training, Attrape Inc.
Firm believer that what you throw out to the Universe is what you get back.